"You could say she's like a new man." While "Infernal Guinea Pig" was a relatively standard Lucifer episode, it did have some especially fun moments. Mostly given to us by guest star Lauren Lapkus, who was a hoot as Pierce's brother Abel. Not that Lucifer wasn't fun. Tom Ellis as Lucifer is always fun; he's why I watch. I mean, the episode began with Lucifer telling the Cain and Abel story with biblical stick figures on a whiteboard. Gotta love biblical stick figures. Of course, Abel ended up in the wrong body, a young woman named Bree, and Bree's murder was investigated by Chloe and Dan. I usually find the inevitable murder investigation to be the least interesting aspect of this show, and this episode was no exception. At least it was short, and the murderer was the obvious suspect, Bree's boss. And a Bolivian cartel. What's up with that? And how come Chloe and Dan did the investigation when technically, Bree was still alive and walking around? Does attempted murder count? The interesting bit about the investigation was that Chloe was upset about Lucifer cheating on her with Pierce (and I mean cheating in an investigative sense, that is). I was happy that by the end, Lucifer was again looking at Chloe as if she meant a lot to him. I'm really impatient by how they keep putting the Lucifer/Chloe relationship on hold. We're nearing the end of season three, people. Is this one of those romances that the writers will withhold from us indefinitely? Okay, here's an ultimatum. 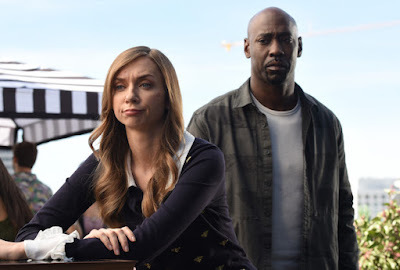 If something doesn't happen between Lucifer and Chloe by the end of season three, I'll... strongly consider the possibility of not watching season four. What I mostly didn't get, though, was why Abel was the first occupant of Hell and had to experience a zillion years of Hell loop torment being killed repeatedly by a facsimile of his brother. Abel was a murder victim. Why would he go to Hell for wanting to kill his brother but not doing it? How is that fair? I suppose it's as fair as Pierce/Cain's punishment, but honestly, it makes God look awfully petty. And I was really disappointed by that last moment when Abel/Bree got mowed down by an ambulance. Abel would have been a fun character to develop a bit more. By the way, what happened to Abel's soul? Please tell me he didn't go back to his loop in Hell. Segue to Charlotte, who had a Hell loop situation in common with Abel and who finally opened up and confided in Linda. The content of Charlotte's Hell loop – having her entire family murdered by the guilty clients she got off when she was a defense attorney – made a lot of sense. No wonder it motivated her to do better. Although prosecutors can make mistakes, too, I have to say. The pointless part of this episode was Maze's continuing fury with Amenadiel because he had the audacity to hook up with Linda. Honestly, I don't get this at all. Maybe Maze just has to be mad about something because she's Maze. Or it was a way to keep Amenadiel in an episode that wasn't about him. Or both. — The title, "Infernal Guinea Pig," referred to Abel, who as the first victim of Hell was the subject of much torture experimentation. Like I said, really not fair. I wish they'd come up with a better reason for Abel to be in Hell. — Liam Wade, who was fun covered with foliage, had posted his manifesto online in his own handwriting. Nobody does that. Way too convenient for the plot. 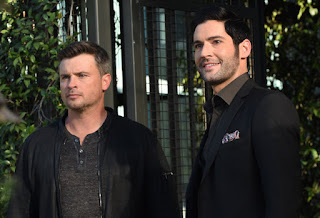 — I could tell this episode wasn't completely grabbing me halfway through when Lucifer and Pierce did a scene in front of the Eastern Columbia Building in Los Angeles and I had to stop the episode to find more information. I'm a former Angelino and a lot of the Lucifer locations make me nostalgic. — While I want more development in the Lucifer/Chloe relationship, I've been enjoying Lucifer's attempts to kill Pierce. It's nice to see Lucifer obsessed with a project instead of just wandering in and out of Chloe's investigations dropping bon mots. — An Honest Fangirl is on vacation this week and will be back to review the next episode. Lucifer: "How much do you hate your brother, on a scale of one to ten?" Pierce: "One thousand infinity plus one." Lucifer: "So what you're saying is Hell made him multilingual and completely adaptable." Pierce: "And we put him in the body of a young woman." Maze: "Where would caveman Lucifer go?" Wade: "Alexa had a lot of enemies: Big Agro, Big Frak, the Bolivians, the carnies." Chloe: "Maybe the Bolivians knew that Bree always opened her boss' mail, used it as a misdirect." Lucifer: "Well, I still don't understand. Why does the Bolivian cartel want a Hollywood assistant dead? Did she neglect to pick the pistachios off their quinoa salad?" I don't know. Maybe two and a half out of four pistachios in a quinoa salad? Well we know that in this show people don't go to hell based on what they do but on the guilt they feel. They sentence themselves to hell basically and can only get out if they get over that guilt. So if Abel felt that guilty about wanting to murder Cain, even though he didn't, then he gets put there. And Charlotte went there because of her guilt about freeing all those guilty clients who are probably going to go kill more innocent people. Abel's torment makes sense if he feels guilty for thinking about and planning to murder his brother, Cain. In return for this Cain finds him and kills him over and over, punishing him like he feels he deserves. Since Cain was the world's first murderer then murder wasn't exactly common back when, so Abel's own plans to kill his brother might have been something he strongly wrestled with and now ultimately feels guilty about, regardless of the outcome. I can understand Maze's fury, after all she's demon not human. How can she get over it when torment, anger, and fighting were all she ever knew for a millennia before coming to LA. Violence has always been her first reaction to any given situation. She really only started to be nicer once she made friends with Chloe and Linda on a girls night out in season 1. Everything she learned about being nice was from her best friend, who has now just betrayed her. Another person (I think the delivery guy) died, making it a genuine homicide. But you're right, he should have gotten a little more attention as he actually did die. I thought this was one of the funniest episodes ever. Lauren Lapkas was hilarious.